It took CompassionWorks International founder Carrie LeBlanc a while to find her calling to make a difference in the world. Henderson resident Carrie LeBlanc has found her calling in animal rights, which prompted her to create her nonprofit, CompassionWorks International. “I want to empower people to speak out against animal cruelty,” she said. It took LeBlanc a while to find her calling to make a difference in the world. Her career was primarily in academia as an art historian. She had always been interested in animal rights issues. LeBlanc protested until she was excused from the assignment. Years later, after that 10th-grade class when she found her calling, she decided to take up the cause of animal rights. She worked with a variety of nonprofits, doing consulting and volunteering. “Most notably, I was the director of operations for Mercy For Animals,” she said. Finally, she decided to start her nonprofit, fighting animal cruelty in the circus industry and trophy hunting. LeBlanc has organized local events and rallies, such as one honoring the memory of Cecil, an African lion that was being monitored by the University of Oxford when it was killed by a big-game hunter in 2015, sparking international outrage. 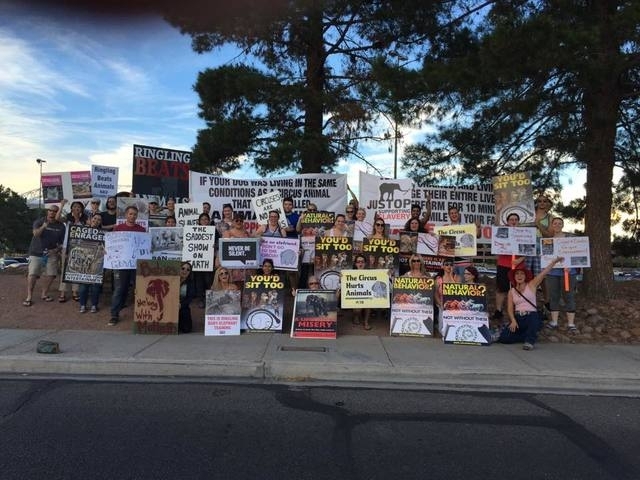 She continues to organize people to speak out against any circus that visits the Las Vegas Valley. “Every time Ringling Bros. comes to town, we try to set things up,” LeBlanc said. This includes organizing others to protest, reaching out to vendors who sponsor the event and passing out information about cruel practices, which LeBlanc said include taking a whip to a tiger to get it to do tricks. LeBlanc said some of the success that has come from animal rights activists includes circuses eliminating the use of the bullhook on elephants. With documentaries such as “Blackfish,” which scrutinized the treatment of marine life in the sea-park industry, causing backlash, LeBlanc said people are becoming more aware of the issues. “We are making a lot of progress,” she said. LeBlanc has also been working on other educational components, such as a festival to highlight local companies that promote animal rights. The Vegas VegFest took place April 9 and featured vendors such as VegeNation and Violette’s Vegan, along with speakers from The Humane Society and The Vegan Bros, Matt and Phil Letten. The Lettens launched their brand in 2014 to break stereotypes about what it means to be vegan. The brothers said they have met everyone from police officers to pastors who have incorporated veganism into their lifestyle. This can include anything from doing meatless Mondays or choosing a day you don’t eat animals or their byproducts. The brothers said events such as the VegFest help educate people about pursing that lifestyle. “We hope to do this annually,” LeBlanc added. Organizers were expecting about 1,000 people but more than 3,000 showed up in the rain to partake in the event. Visit cwint.org, email info@cwint.org or call 877-263-2772.